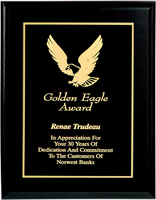 Scroll down for a great selection of Engraved Plaques in popular finishes and sizes. 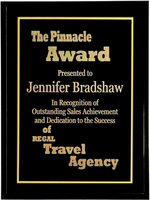 Black Plaque (10x8, Horizontal)Beautiful Black finish plaque. Choice of engraving plate color. Black Plaque (7x9, Vertical)Beautiful Black finish plaque. Choice of engraving plate color. Black Plaque (9x12, Vertical)Beautiful Black finish plaque. Choice of engraving plate color. Walnut Plaques (10x8, Horizontal)Beautiful Walnut plaque. Choice of engraving plate color. 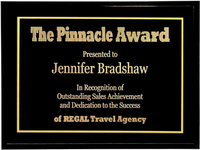 Walnut Award Plaques (7x9, Vertical)Beautiful Walnut plaque. Choice of engraving plate color. Walnut Plaques (8x10, Vertical)Beautiful Walnut plaque. Choice of engraving plate color. 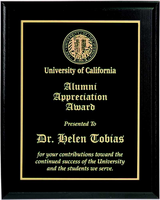 Black Piano Engraved Award Plaques (9x7, Horizontal)Beautiful Black Piano finish plaque. Choice of engraving plate color. 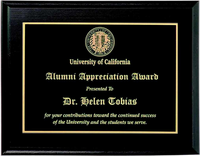 Black Piano Award Plaques (12x9, Horizontal)Beautiful Black Piano finish plaque. Choice of engraving plate color. Star PlaqueAvailable in two sizes, 7" x 9" and 8" x 10". Lapis Wall Plaque (12" x 15")Genuine walnut; measures 12" x 15". Custom engraved plaques on this page are organized by finish: cherry, black, walnut and black piano. 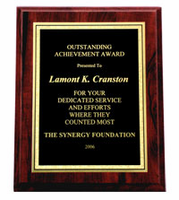 These plaques are perfect for wall mounting, and most are available in horizontal or vertical orientations. 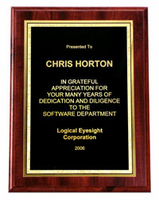 Many also offer a choice of engraving plate color. You can choose to personalize your plaque yourself or leave it to the experts at TrophyCentral. 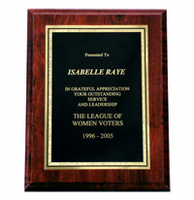 We offer FREE PLAQUE ENGRAVING, as well as FREE SHIPPING on online award orders over $100. 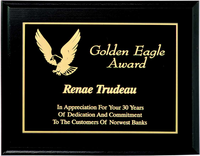 If you are looking to buy engraved plaques online, look no further! TrophyCentral has a great selection that will fit any budget. Our experts in New York and Michigan have been providing help and ideas since 1999! 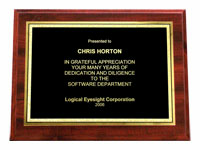 To find the perfect custom plaque, use our search above, or for personal service, call us toll-free at 1-888-809-8800.